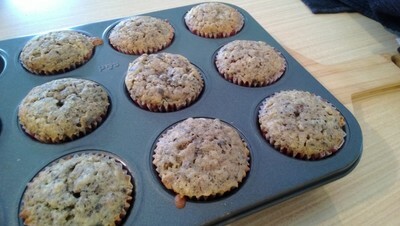 Preheat oven to 180 C and line a cupcake/muffin tin with cupcake liners. In another bowl, sift flour and baking powder together. 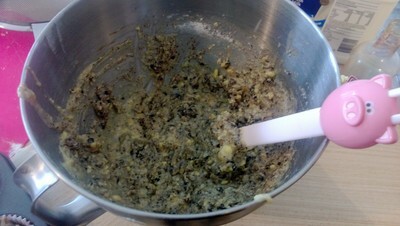 Add half of the dry mixture to the wet ingredients and mix until just combined. Add the milk. Once mixed, add remaining dry ingredients. Crush the Oreos and fold them into the batter. Pour into cupcake tins and bake for 20-25 mins. Allow to cool before frosting. For frosting: Start creaming the butter and add powdered sugar gradually until mixed. It should look fluffy and creamy. Mix in the vanilla. Add the milk, Continue to add milk and sugar, small amounts at a time, until you get your desired consistency. 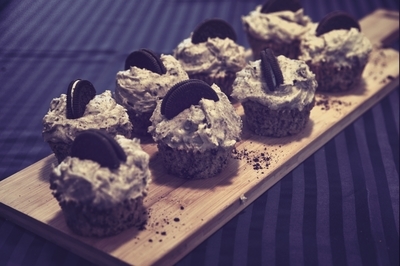 Crush Oreos and fold them into the frosting. Note: Because of the biscuits in the icing it is almost impossible to use a piping bag to frost these cupcakes as the cookie pieces clog it up. Simply go for a rustic style and use as a spoon to pile it on!